To code or not to code – that is the question that has been debated hotly for more than two decades now in many countries around the world – including New Zealand. Like many other countries, New Zealand put all of its eggs into the 'ICT and digital literacy for all" basket from 1990, when the first MoE-funded professional devleopment programmes began. That philosophy has underpinned all of the ICT-PD strategies and spending to the current day – the argument being that ICTs (or digital technologies as they're now being referred to) are a part of everyone's experience, not simply those who are programmers. As we are now in the fourth decade of having computers in our schools, there's a growing awareness that, as the tide of digital literacy has risen, and we're seeing ICTs used routinely by students in schools across a wide range of contexts to support their learning, simply teaching learners to be users (or consumers) of the technology, without teaching them fundamental skils of creating or constructing with these tools is tantamount to teaching kids to read, but not to write, to listen but not to speak, or teaching them to appreciate art, but not to draw etc. The simple truth is that while we all marvel at what these new tecnologies can do – someone has had to design, create, build, program and test them. So it makes sense that somewhere in our system we're creating opportunities for our young people to learn skills that are foundational to an ever growing need in our future workforce. Of course, skills for employment are only one part of the reason for introducing such an initiative. This recent report from European SchoolNet emphasises the wider significance of teaching coding and computer science within our curriculum. The report states..
Coding is becoming increasingly a key competence which will have to be acquired by all young students and increasingly by workers in a wide range of industries and professions. Coding is part of logical reasoning and represents one of the key skills which are part of what is now called "21st Century Skills". The report outlines responses from 20 countries to a survey where their Ministries of Education gave an overview of their current initiatives and plans. Across this sample of countries it is evident that they see a wider range of benefits accruing from including coding and computer science programmes in schools, including fostering logical thinking skills, coding and programing skills, problem-solving skills, skills for employment, as well as fostering other key competencies. 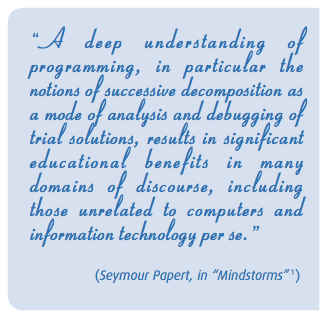 I was a part of the generation who grew up introducing computers into my classroom under the influence of Seymour Papert, being fascinated with what could be achieved using Logo, and later with Scratch, as well as learning the fundamentals of Basic and later HTML. Finding out what made the computer work the way it did intrigued me, and so discovering that I could create instructions that would get the response I desired seemed a natural thing to do. Of course, that's fine for someone like me who has a natural interest in such things. But introducing a curriculum requirement for all schools to include coding in their curriculum begs a simple question, "who will teach it?". In an already crowded curriculum, and with change being naturally resisted by many, this is an extraordinarily big challenge. I noted with interest that even England's 'year of code' initiative has attracted cynical responses when the director of the programme herself revealed that she doesn't know how to code. I see these issues becoming a big challenge for New Zealand into the future. We are a small country, 10,000 km from our markets, with an economy reliant on the export of primary produce products. Into the future we'll need to put more emphasis on the development of knowledge economy skills, because (a) of the impact of much of our primary produce production on our local environment, and (b) the fact that our traditional export markets are now establishing their own means of supply negating the expense of long distance exports. If we're to heed the challenges of the late Sir Paul Callaghan and others, we need to find ways of appropriately incorporating more coding opportunities within our school curriculum across all age groups. As a parent and as a grandparent, I am increasingly concerned that we act now to ensure my kids and grandkids are equipped with the skills, competencies and dispositions they will require to enable them to function effectively in an increasingly digital world – and exposure to the delights of coding and computer science must certainly be considered here. I've just arrived back from a trip to Chengdu, China where I was present for the signing of the Sichuan Christchurch Education Alliance. Nearly 40 educators from greater Christchurch were present, with a key focus of the time spent on developing relationships that are intended to lead to opportunities for educational exchanges between Christchurch and Chengdu teachers and students. Globalisation will undoubtedly be one of the most significant influences on modern learning practice as we look further into the 21st century. The need for students to have well developed understandings of cultural literacy, inter-cultural awareness and a basic grasp of international language(s) must inform how we shape our curriculum and the sorts of learning experiences we provide for our young people. It's no longer satisfactory to simply teach about these countries and issues – we need to be exploiting the power of online technologies and authentic learning contexts to enable our students to interact directly with people in other places, and to collaborate on projects that lead them to these deeper understandings of the impact of globalisation. The trip to Chengdu has reinforced this for me – and coming back to NZ on the day of the national election and the associated conversations about what people in our nation consider important even more-so. We cannot ignore the impact that being a part of a global village, with its global economy, will have on the lives of our young people into the future. Preparing them in this way must be a priority in our curriculum ad everyday practice. The map at the top of this post links to a post of 38 maps that explain the global economy – a useful resource for educators interested in thinking about the impact of the global economy and how to relate this to students – as is this link showing where the oldest and youngest people live in the world's populations. This sort of information can be very useful in forming a more global picture of the sorts of issues that face us here in NZ, now and into the future. Occasionally I come across a resource site for teachers that I feel is worthwhile sharing on my blog – today it's energy kids – developed and made available by the US Energy Information Admistration. Energy – its production, use and conservation – is a hot topic for today's young people. It will be one of the things that defines how society develops into the new millennium as old forms of energy are depleted and new forms are developed, experimented with and adopted. Our young people will need to be well informed about these issues – and many of them will find employment in energy-related areas, so the focus on this in our schools is very important. What I like about this site is that it's a veritable treasure trove of key information about energy, that will appeal to and inform kids of all ages – and their teachers. It's an ideal site to be used as a reference for an inquiry topic, self study or you could use some of the games and activities as a part of a whole class activity. I found the section on the history of energy really intriguing, satisfying the belief I have about needing to look into the past to really understand the future. There's a great deal of well presented information here that could provide a springboard for further inquiry. On the topic of energy – let's not forget Electrocity, a game-based resource that helps develop understandings about the electricity supply chain – developed by the NZ electricity company, Genesis Energy. I'd be keen to hear from anyone using these resources. I'm about to take three week's leave and travel with my wife to the US, and in preparation, I've been choosing some novels to take with me to read. Reading for pleasure is one of those activities that can easily be 'lost' in the competition for time to keep abreast of all of the professional reading that comes across my desk, plus, of course, the interminable barrage of emails that require reading and dealing with each day. Yet while reading all of that sort of thing may be intellectually stimulating and professionally engaging, nothing beats the sheer enjoyment of sitting with a good novel and reading purely for pleasure – to get lost on the plot of a gripping thriller, or carried away with the imaginations of an historial novel etc. In the modern world, of course, there's more competing with reading for pleasure in the lives of our children than simply reading texts and emails – their lives are full of TV, computer games and other forms of 'quick fix' communications – yet even for them, a good book can be extremely engaging. So it was with interest tonight that I came across this briefing note from the Department of Education in the UK, titled Encouraging reading for pleasure: What the research says on reading for pleasure. The first section of the briefing note highlights research evidence on reading for pleasure from domestic and international literature; exploring evidence on the trends and benefits of independent reading amongst both primary and secondaryaged children, as well as why children read. The second section of this briefing covers the evidence on what works in terms of promoting reading for pleasure. It can have a positive impact on pupils’ emotional and social behaviour It can have a positive impact on text comprehension and grammar. No particular surprises here for those who have been involved in teaching reading for a while – but a very useful paper to support teachers and schools that may be considering bringing back the good old 'silent reading' period in class, or promoting reading for pleasure as a key part of their reading programme. The full paper can be accessed as a PDF file here. The ideas in the booklet are grouped according to the age of the students, and use the “4Cs” from the Partnership for 21st Century Skills as a framework for emphasising the educative value of the learning resources that are shared. Collaboration: Students are able to work effectively with diverse groups and exercise flexibility in making compromises to achieve common goals. Creativity: Students are able to generate and improve on original ideas and also work creatively with others. Communication : Students are able to communicate effectively across multiple media and for various purposes. Critical thinking: Students are able to analyze, evaluate, and understand complex systems and apply strategies to solve problems. Each resource is briefly described, followed by a section on 'how to get involved', providing practical suggestions for how to engage with and use the resource with you children. The resources provide a range of engagements, from projects that promote particiation in social change and the development of digitial citizenship, to using online games and social media to promote collaboration and support project based learning – plus everything in between. I like the section at the end titled Ten tips for bringing 21st century skills home which provides sompractical tips and links for parents wondering how to foster the 4Cs at home. If you're not a member of the Edutopia site, here's a good reason to do so – it costs nothing to sign up, and the resource is free tod ownload to members. it's always useful at the start of a school year to come across resources that might be useful in the school programme. 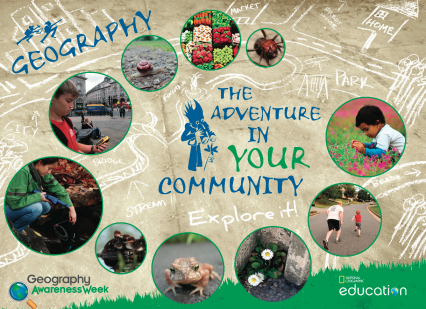 This one from National Geographic Education came to me through TES Online, and is intended to support Geography Awareness week (which I wasn't aware existed). The parent guide provides an excellent overview of the sorts of activities and challenges you can set kids to do – it would make a superb resource for teachers also to incorporate some of these activities into a classroom programme. The resource is designed to invite individuals or teams of students, families, or friends to explore their own communities anew through geographic eyes by undertaking a series of “missions.” These missions emphasize geographic skills such as photography, storytelling, mapping, and taking action. Complete missions and earn points toward badges in each of the skills, demonstrating that you are able to see your community and the rest of the world with deeper understanding. NB: You need to create a TES account to access the resource, but it's straight forward and extremely worthwhile doing so. You can't believe everything you read on the Internet. How do you evaluate the reliability of online information? 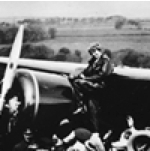 Check out the conference archives from this National Air and Space Museum interactive online conference developed especially for teachers and secondary students. Historians and educators from the Museum, and guests from the Department of the Navy and National History Day, demonstrate critical thinking skills they use to evaluate information. Find the exciting FREE conference recordings here. If you're a chemistry teacher you have to like this one – a periodic table consisting of an array of QR codes that link you to a video abut that particular elements. I've tried it using the bar code scanner on my android phone and it worked brilliantly – you can adjust the size of the image on your screen so that the scanner gets a good read.